We’ve all tossed around expressions about work life balance, and they have different meanings to different people. But how many of us actually keep track of our balance in a systematic way? What if you could measure your balance on a regular basis to uncover insights about your happiness or career satisfaction? Or learn how problems with your kids, partner, or other factors affect you in other areas of your life? The “wheel of life” has a long history; it’s originally from the Indo-Tibet region – as the Bhavacakra. It’s a powerful way to identify areas in your life that require attention and help you move up the satisfaction food chain. Kevin Burgess describes four states people are always in: Survival, Sustainment, Success, and Significance. Where are you? 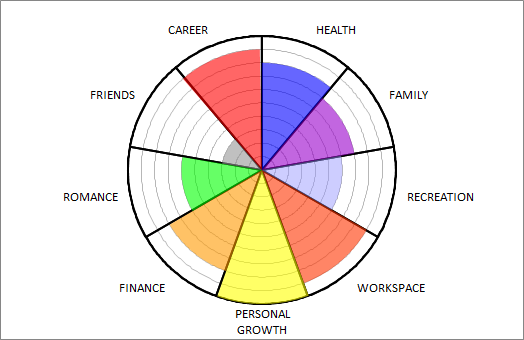 As you fill out your wheel of life think about how problems in one area affect the others. You can create a simple radar chart in excel or download this chart here. Consider each category and assign a score. Are you generally healthy, other than the normal aches and pains that accumulate over the years? Do you get enough sleep and exercise? Are you comfortable with your weight? or battling habits and addictions like caffeine, nicotine, alcohol, or obsessive eating? Is your family supportive, available, and healthy? Are they a source of strength and encouragement or a drain? Are you caring for someone who is sick or disabled? or coping with a troubled child? Do your friends push you forward or demand support? Are they coaches and cheerleaders or emotional vampires? Are you doing well and saving for retirement, or does your income just cover your bills? Conversely, are you battling with medical bills, late fees, and home and auto repairs that threaten to swamp you? Give yourself a high score if you’ve paid off debts with a windfall. Do you have time for yourself and spend it on activities that you enjoy and look forward to, that energize you, and increase your satisfaction? Do you have written goals and a plan to achieve them? Is formal training part of your day-to-day life or something you avoid? Are you satisfied with the three “R’s” Responsibility, Recognition, and Rewards provided by your job? Is there a clear path to achieve your goals? Do you have the support you need to reach them? Your office space or work space should be ready for you to do your best work. Does it help you or get in the way? Is your space clean, and workable or cluttered and disorganized. Do you have to hunt for things when you need them, or are they ready for quick use? Is your romantic life satisfying? Do you feel loved, and receive attention, affection, and support? Does your partner feel that way? Once you’ve recorded your responses plot them on the wheel and add a score to describe your happiness, satisfaction, optimism, and choose which of Kevin’s four phases you’re in now – put the date on it and keep it at your desk. Revisit the wheel again in six months to learn how happiness, satisfaction, and optimism ebb and flow as multiple dimensions in your life change.